The fourth metro system to begin operations in Mainland China, the Guangzhou Metro system began operations on the 28th of June, 1997. This rapid transit metro, operates along 9 lines, serving 167 stations in total. With expansion plans already under way, 3 more lines are expected to be constructed by the year 2020. 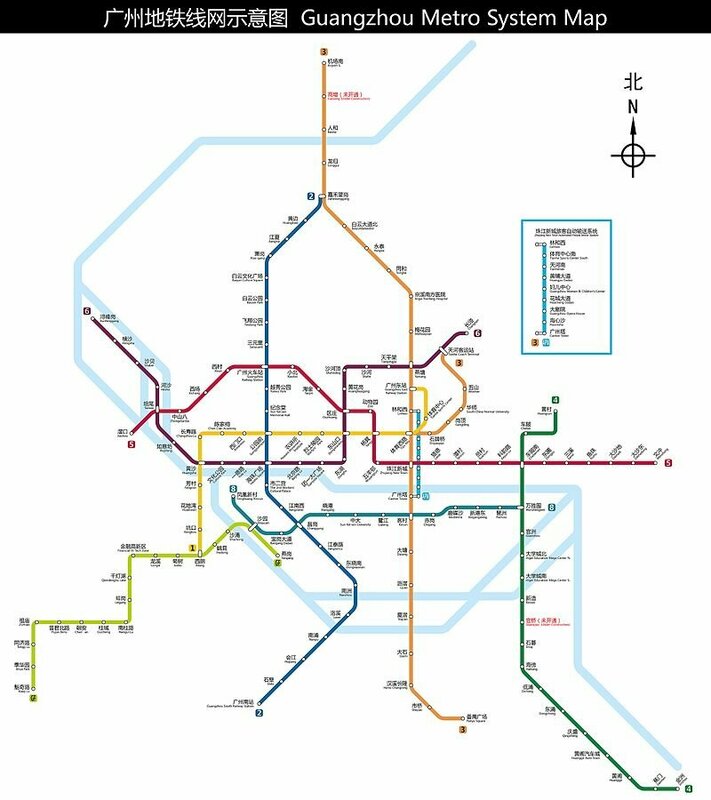 Although, the metro primarily operates in the urban areas of the city of Guangzhou, there are a couple of lines which serves the suburban areas as well. With an annual ridership of 2.40 billion (2015), it is one of the busiest metro systems in the world, the sixth busiest to be precise. The 267.5 km long network, is responsibly operated by the Guangzhou Metro Corporation. The metro service starts operations around 6:00 am and runs until midnight. The metro runs all seven days of the week. The fares on Guangzhou metro are distance based and range from 2 Yuan to 14 Yuan. Riders can purchase single journey ticket which is valid for a single journey on the date of purchase. For a distance of 0-4 km, the standard fare is 2 Yuan. After 4 km, 1 Yuan is charged for every 4 km, for every 6 km after 12 km and for every 8 km after a distance of 24 km. The journey must be completed within four hours otherwise the passenger is charged the fare for the longest journey.The single journey tickets can be purchased from vending machines or kiosks located at every station. These are radio frequency plastic tokens that have to be tapped at the sensor on the ticket barriers during entry, and while exit, these tokens are retained at the slots. Group discounts of 10% are provided on these tickets, for a group of 30 and more people. Riders can also make fare payments by using contactless smart card called Lingnan Pass: Yang Cheng Tong. This card can be used on the metro, buses and public transport. For each month, the Yang Cheng Tong card provides a discount of 5% for the first 15 journeys, and a discount of 40% for subsequent journeys. Senior citizen pass provides a discount of 50% for seniors aged 60-64 years. The pass must be activated before using the metro service to take advantage of 50% discount on offer. A Student pass can be used by students of primary, secondary and vocational schools. This card entitles them to a discount of 50%. Day passes are also available that provide unlimited rides on the metro system during the validity period of the pass. A one day pass can be purchased for 20 Yuan and is valid for duration of 24 hours. A three day pass costs 50 Yuan and is valid for 72 hours or three consecutive days. For senior citizens aged 65 and above, there is a Guangzhou senior citizen card available, which provides free access to them. However, similar conditions with regard to its activation are applicable. Guangzhou metro offers park and ride facilities at most metro station. The maximum weight of luggage while travelling on the metro system is 30 kgs. A child who is under the height of 1.2 meters, can travel with a fare paying adult for free. However, if his/her height exceeds this, a separate ticket has to be purchased for them. ● Line 1 – Line1 was opened in 1997 and the metro runs between Xilang and Guangzhou east railway station. The length of the route is 18.5km serving 16 stations. All the stations are built underground. ● Line 2 – Line 2 was opened in 2002 and the metro runs between Jiahewanggang and Guangzhou south railway station. The length of this line is 31.4km serving 24 stations. ● Line 3 – Line 3 was opened in 2005 and the metro runs between Airport South and Tiyu Xilu. The Y shaped line has a length of 67.3km serving 28 stations. ● Line 4 – Line 4 was opened in 2005 and the metro runs between Huangcun and Jinzhou. The length of this line is 43.7km serving 16 stations. ● Line 5 – Line 5 was opened in 2009 and the metro runs between Jiaokou and Wenchong. The length of this line is 31.9km serving 24 stations. ● Line 6 – Line 6 was opened in 2013 and the metro runs between Xunfenggang and Changban. The length of this line is 24.5km serving 22 stations. ● Line 8 – Line 8 was opened in 2003 and the metro runs between Fenghuang Xincun and Wanshengwei. The line serves south bank of Pearl River from west to east. The length of this line is 14.8km serving 13 stations. ● Guangfo – Guangfo line is the first intercity railway underground line connecting Guangzhou City and Foshan City. Guangfo line was opened in 2010 and the metro runs between Kuiqi Lu and Xilang. The length of the route is 20.4km serving 14 stations. ● APM – APM is an underground light rail system which was opened in 2010. APM is the world’s first underground and unmanned rail. The metro offers service between Linhexi and Canton Tower. The length of the route is 3.9km serving 9 stations.